Hogan said he wanted to ban abortions, including in cases where the mother’s life is at risk. 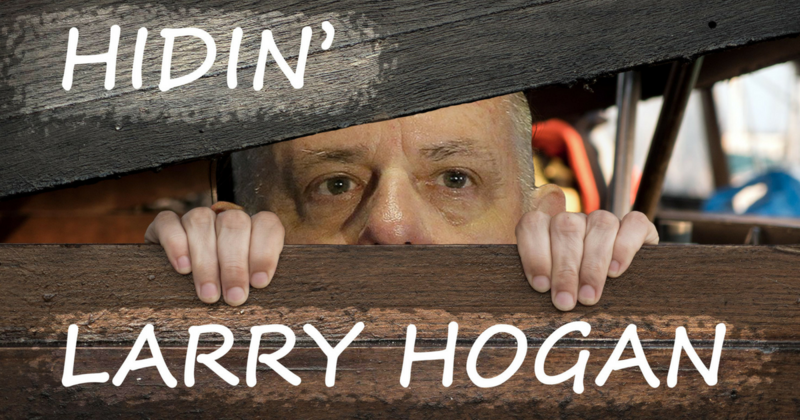 Hogan also worked with his father, who was then serving as Prince George’s County Executive, to draft an executive order that banned abortions at county hospitals. When a Circuit Court judge overturned the order, Governor Hogan said he was “disappointed with the judge’s decision” and added that his father’s staff was already preparing legislation to ban abortions in Prince George’s County (Source: “Abortion Bill Defeated In Pr. George's Council; Prince George's Council Vetoes Abortion Bill.” Loretta Tofani, Washington Post, 9/2/81). 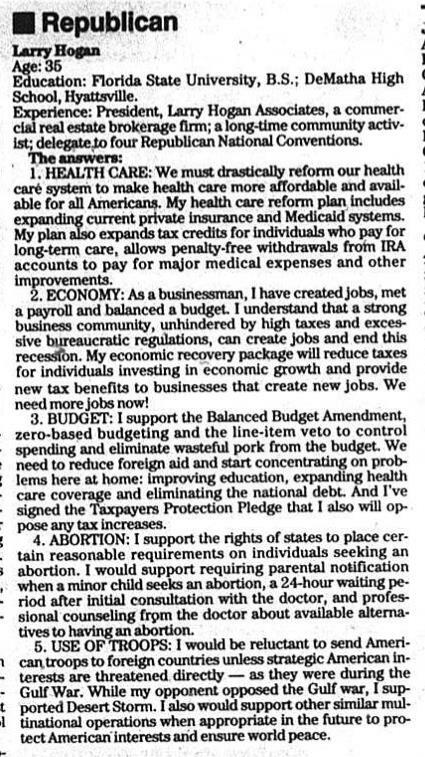 A 1980 profile of Hogan, Sr referred to Governor Hogan and his father as the “First Family in Maryland when it comes to opposing abortion.” The Post noted that Hogan’s uncle, a physician, had also lobbied the state to ban abortion (Source: “Turning a Moral Issue Into Political Squabble.” Richard Cohen, Washington Post, 12/9/80). 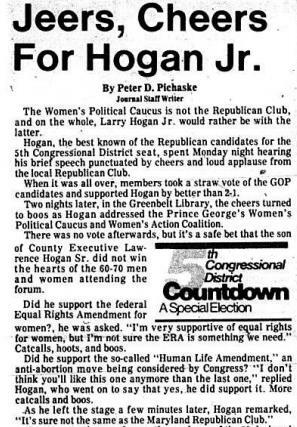 In 1981, Hogan said he supported the anti-abortion “Human Life Amendment” that was being debated by Congress at the time. The Human Life Amendment is an amendment to the Constitution that reads: “The paramount right to life is vested in each human being from the moment of fertilization without regard to age, health or condition of dependency.” The current version of the Human Life Amendment at the time of Hogan’s statement was the Paramount Amendment, which would ban abortion. 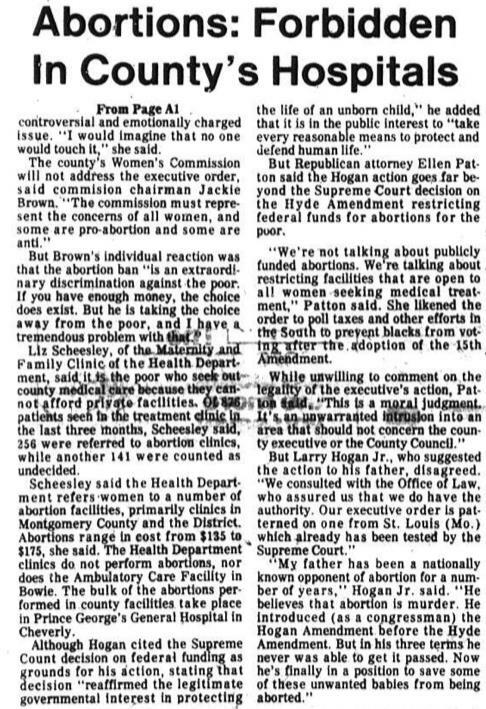 During Hogan’s failed bid for Congress, the Washington Post wrote that Hogan had campaigned for an “antiabortion amendment to the Constitution” (Source: “Prince George's Voters Face 31 Political Flavors at Polls on Tuesday.” Margaret Shapiro, Washington Post, 4/5/81).